Gingerbread is said to have been invented by the Greeks around 2800 B.C. At first gingerbread was made with breadcrumbs and sweetened with honey, but as it made its way throughout the world it was adapted to meet the tastes of different cultures. That is why if you sample gingerbread in a country, other than your own, it may not look or taste as you expected. It can be a bread, a spicy sweet cake or a molded/shaped cookie that can range from light colored with just a touch of spice to dark colored and very spicy. In England and North America, we like to make our Gingerbread with either treacle or molasses instead of the original honey. The British favor treacle which has a much stronger taste and darker color than the milder tasting and lighter colored molasses that we like in America. Ground ginger is always present and, at least in America, ground cinnamon and oftentimes ground cloves and even nutmeg. 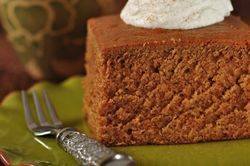 It seems to me that Americans are more partial to gingerbread cookies than cake but this is a shame as this moist and flavorful Gingerbread Cake is really the perfect dessert for fall and winter. This recipe is also very adaptable. Although it contains lemon zest you could use the zest of one orange. Toasted nuts, minced fresh ginger, or even crystallized ginger could be added. For the brave at heart a little ground black or red pepper could be added for heat. Now, this Gingerbread Cake is very nice plain but it's also very nice when frosted with a lemon flavored icing. The lemon frosting recipe given here dries to a beautiful, satiny smooth, crusty finish. If you like accompany this cake with softly whipped cream, lemon curd, or even apple slices that have been sauteed in a little butter and sugar. Note: There are two types of molasses generally used in making gingerbread: light and dark. Light molasses, used in this recipe, comes from the first boiling of the sugar syrup and is lighter in flavor and color than the dark molasses. Dark molasses comes from the second boiling and is darker in color with a more robust flavor. Molasses is usually labeled as "sulphured" or "unsulphured" depending on whether sulphur was used in the processing. The unsulphured molasses is lighter in color and tends to have a nicer flavor. Molasses is used in baked goods to add color, moistness and flavor. In a separate bowl, whisk together the flour, baking soda, baking powder, salt, ground cinnamon, ginger, cloves, lemon zest, and grated ginger (if using). In bowl of your electric mixer (or with a hand mixer), beat the butter and sugars until light and fluffy (about 2-3 minutes). Add the eggs, one at a time, beating well after each addition. Add the molasses and beat to combine. Scrape down the sides of the bowl as needed. Add the dry ingredients (in three additions) and the milk (in two additions), alternately, beginning and ending with the dry ingredients. Beat just until incorporated. Pour the batter into the prepared pan and smooth the top with the back of a spoon or an offset spatula. Bake for 30 - 35 minutes or until a toothpick inserted into the center of the cake comes out clean. Remove from oven and let cool on a wire rack. If desired, frost with the Lemon Icing. Lemon Icing: Mix together the sifted confectioners' sugar and lemon juice until smooth. (The icing should be thick but still spreadable.) Pour the icing onto the center of the cake and spread with an offset spatula. This cake will keep for several days at room temperature. Can serve with softly whipped cream, lemon curd, or slices of apples sauteed in a little butter and sugar.